NOS GE USA JAN 12AX7 MILITARY 12AX7WA ECC803S NOS DIGITAL BALANCED PERFECT TRIO! CREAM OF THE CROP STRONGEST SUPER-TUBES HIGHEST EMISSIONS - GREAT MATCHED TRIOS! How many times have you purchased what you read advertised as a balanced and matched-triode tube off the internet and have received mismatched or marginal tubes? Well, get rid of those! Here are the HIGHEST QUALITY AMPLITREX DIGITALLY TESTED NOS (NEW OLD STOCK) NIB (NEW IN BOX) GE JOINT ARMY NAVY (J.A.N.) 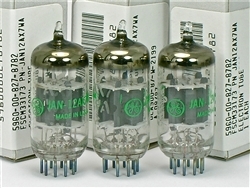 12AX7-WA tubes that were made in the 1950's that will end your search for the Top Quality you would expect from a Premium tube in your ultimate HI-FI AMPLIFIER or Musical Amplification system. These tubes actually have THICK mica spacer insulators! (2 sandwiched mica insulators) but we will call these 2-mica or double mica tubes - this doubling up of the top mica adds to the 12AX7-WA "ruggedized" construction classification of all J.A.N. MILITARY SPEC tubes capable of being held in 3 different positions in a Navy type (flyweight) Shock Machine and are subject to 600 g impact acceleration & 2.5 g vibrational acceleration at 25 cycles for 32 hours in Factory testing and burn-in. Made in USA WITH GE CODES. See the glass acid codes of 12AX7-WA U.S.A. with 86-44 = 1986 - 44th week made. The WA = LOW-NOISE CLASS of tube. 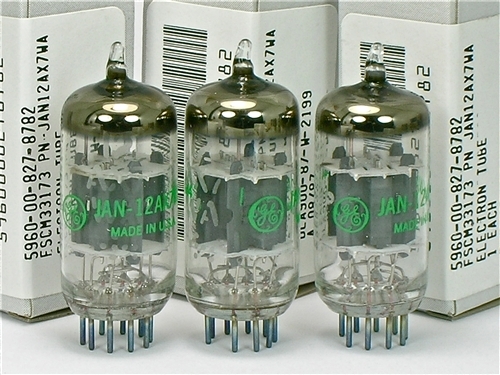 SIMPLY the PERFECT SINGLE REFERENCE 12AX7-WA AMPLITREX TESTED TUBES BY WHICH ALL OTHER 12AX7's CAN BE MEASURED BY! All tubes measure VERY STRONG averaging from 1,600 or 100% to 1,700 or 106% GM uMhos (mA/V) per triode which is Balanced & Matched and 100% to 130% mA or 1.2mA to 1.4mA WOW! Tested on the Amplitrex as displayed below in the "fixed-bias" setting which is the most accurate bias setting, with a test specification iP of 1.2mA and 1,600 GM/uMhos spec. These SUPER-TUBES measure 1.2 to 1.4 mA! WOW!